barcode new items and enter pertinent information of new property items, transfer, and retirements of excess property in the property management tracking system; prepare documentation for disposition of excess property; and prepare and track government property passes. Responsible for ensuring that furniture items are maintained at pre-determined levels as defined. We offer several different types of shipping services and moving services. We can match the service to fit your need. 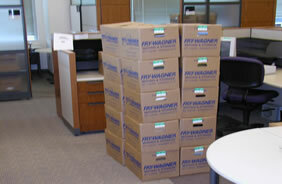 The most common types of moves or shipments involve boxes or crates, furniture, or other office furnishings.